Revolutions and violent regime changes, be they as recent as that of the Arab Spring or as old as the 1789 French Revolution, have received lots of attention in academic circles. These major political disruptions are perceived as inflection points in the economic and political trajectory of the affected societies. However, whether these watershed events have long-run consequences on the living conditions for the majority of the population, and if so how, is widely debated. In this column, we focus on the 1789 French Revolution. It is in many ways an ideal lens through which to investigate these issues given the relatively abundant archival material and the fact that enough time has elapsed since its occurrence, enabling an assessment of both the medium- and long-term impact of revolutionary policies. 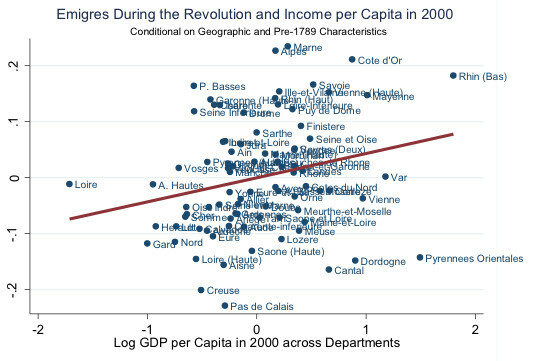 Most research on the economic legacy of the French Revolution falls into two opposing camps. On the one side, a line of research highlights its role in ushering the French economy into the modern era, as manifested in the abolition of the feudal system, the simplification of the legal system, and the reduction of traditional controls and fiscal hindrances to commerce and industry. This perspective begins with 19th century thinkers such as Thiers (1823-1827), Guizot (1829-1832), and Marx (1843 ) and is continued during the 20th and 21st centuries by broadly left-leaning scholars like Jaurès (1901-1903), Soboul (1962), and Hobsbawm (1990), who view the French Revolution as the victory of bourgeois industrial and commercial interests over the landed aristocracy. Most recently, empirical research by Rosenthal (1988) on land redistribution and by Acemoglu et al. (2011) on the consequences of the French Revolution in Germany lends credence to this view. On the other side, mostly classical liberal or conservative intellectuals (e.g. Taine 1876, 1893, Cobban 1962, Furet 1978, or Schama 1989) emphasise that, compared to advanced industrial countries such as England and Germany, France remained mostly agricultural until 1914. They argue that the French Revolution was not motivated by differences in economic interests between the nobility and the bourgeoisie, but was rather a political revolution with social and economic repercussions. They claim that the French Revolution was actually ‘anti-capitalist’ (Cobban 1962), and that this explains the persistent agricultural character of France during the 19th century. 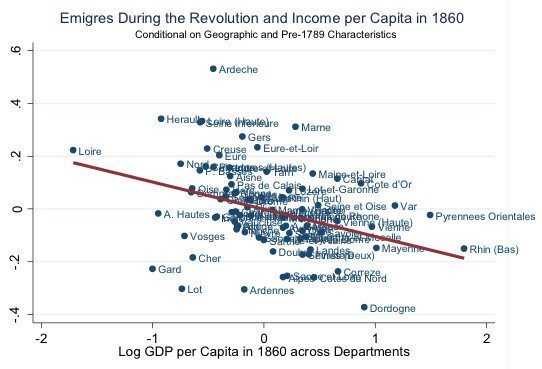 Recent empirical works by some of us attempt to reconcile these divergent views by focusing on how revolutionary policies had differential impacts across French departments (the administrative divisions – equivalent to US counties – created during the Revolution). While one study exploits the confiscation and auctioning of Church property that occurred at the start of the Revolution (Finley et al. 2017), the other one focuses on the flight of the emigrés, which accelerated after the summer of 1792, to assess the consequences of changes in the composition of the local elites on economic performance (Franck and Michalopoulos 2017). In both studies, we highlight the time-varying role of the distribution of agricultural land holdings in shaping economic development during the 19th and 20th centuries. The law passed by the French Constituent Assembly on 2 November 1789 confiscated all Church property and redistributed it by auction. Over the next five years, more than 700,000 ecclesiastical properties – about 6.5% of French territory – were sold in what historian Georges Lecarpentier (1908) termed the “most important event of the Revolution”. In Finley et al. (2017), we exploit the extensive spatial variation in confiscations of Church property to investigate the importance of the initial allocation of property rights for the success of institutional reform. Our empirical analysis then combines the highly disaggregated data collected by Bodinier and Teyssier (2000) on revolutionary confiscations of Church lands with data from successive agricultural surveys between 1841 and 1929. 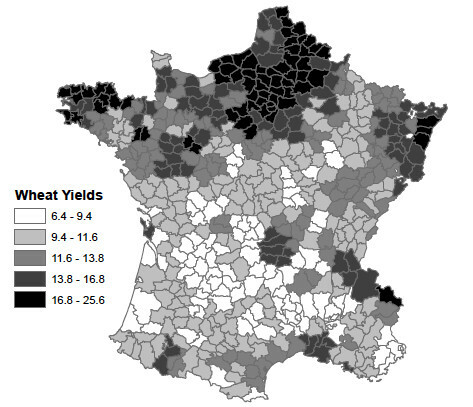 The dataset covers 194 French districts in 62 departments (out of 86) where the share of ecclesiastical property varied between 0% and 40% as Figure 1 shows. 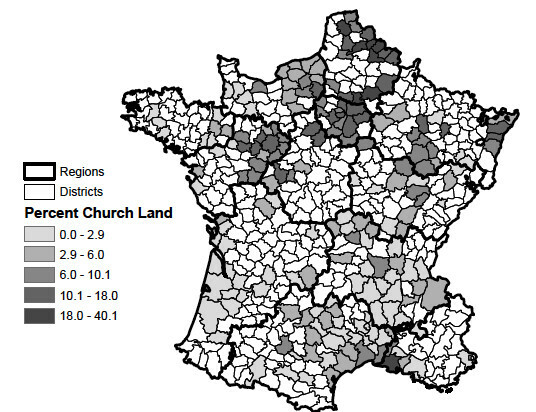 We find that in regions where more church land was auctioned off, land inequality was higher in the 19th century. Further, we show that this wealth imbalance was associated with higher levels of agricultural productivity and agricultural investments by the mid-19th century. Specifically, a district with 10% more Church land redistributed had 25% higher productivity in wheat production (see Figure 2), about 1.6 more pipe manufacturers (used for drainage and irrigation projects), and about 3.8% less land left fallow. In the paper, we implement several empirical strategies to improve on identification, including controlling for 12 region-fixed effects, running a placebo analysis using potato yields, and implementing an IV analysis premised on the proximity of a district to bishoprics established in the 12th century. 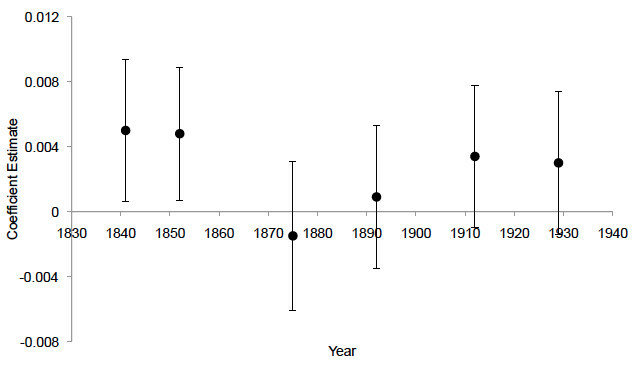 Our study also shows that the beneficial effects of revolutionary land redistribution on agricultural productivity gradually declined over the course of the 19th century, as illustrated in Figure 3. This result is consistent with other districts gradually overcoming the transaction costs associated with reallocating the property rights that came with the feudal system. Another aspect of the demise of the feudal system during the French Revolution was the flight of the emigrés. More than 100,000 individuals, who were mainly supporters of the Old Regime, fled France to escape revolutionary violence. Data collected by Greer (1951), illustrated in Figure 4, show the spatial distribution of the emigrés in each department between 1789 and 1799. To get plausibly exogenous variation in the emigration rates, a study by two of us (Franck and Michalopoulos 2017) exploits local variation in temperature shocks during the summer of 1792 when a wave of revolutionary violence, known as the Second Revolution, culminated in the imprisonment of King Louis XVI and the proclamation of the First French Republic on 21 September 1792. The logic of our identification strategy rests on a well-developed literature that links variations in economic conditions to the opportunity cost of engaging in violence. Insofar as temperature shocks decreased agricultural output, an increase in the price of wheat (the main staple for Frenchmen in the 18th century) would intensify unrest among the poorer strata of the population, thereby magnifying emigration among the wealthy supporters of the falling Monarchy. 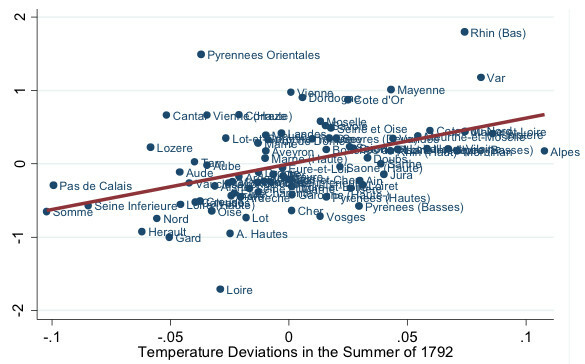 Figure 5 shows that a greater share of the population did, indeed, emigrate in departments that experienced larger temperature shocks, proxied by the squared temperature deviation in summer 1792 from standard temperature levels. The main results of this study are illustrated in Figure 6, revealing the non-monotonic impact of emigration on comparative development over the subsequent 200 years – high-emigration departments had significantly lower GDP per capita during the 19th century, but the pattern reversed over the 20th century. More precisely, a 0.5% increase in the share of émigrés in the population of a department decreased GDP per capita by 12.7% in 1860, but increased it by 8.8% in 2010. This reversal can be partially attributed to changes in the composition of agricultural land holdings. 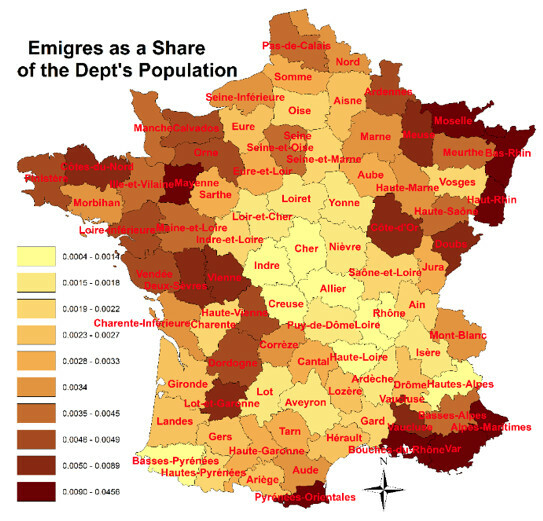 The study uses the successive French agricultural censuses from the mid-19th century onwards to show that high-emigration departments have had fewer large landowners to this day. This reduction in the preponderance of large private estates and the development of a small peasantry had a negative impact on agricultural productivity via limited mechanisation. Moreover, the study shows that the share of rich individuals in the population of high-emigration departments during the 19th century was significantly smaller compared to regions with fewer émigrés. This absence of a critical mass of sufficiently wealthy individuals in the era of capital-intensive production may also explain the low degree of industrialisation in high-emigration departments during the 19th century. Nevertheless, once the French state instituted free and mandatory education in 1881-1882, it is in these initially lagging departments that human capital accumulation took off, leading to higher incomes in the latter part of the 20th century. Overall, our two recent empirical studies (Finley et al. 2017, Franck and Michalopoulos 2017) are related to theoretical studies by Galor and Zeira (1993) and Galor and Moav (2004), which argue for a non-monotonic role of wealth inequality in the process of development. When growth is driven by physical capital accumulation and capital markets are imperfect – as was the case during the 19th century – a larger concentration of wealth in the hands of fewer individuals is beneficial to growth. Conversely, in the presence of capital market imperfections, when human capital becomes the driver of growth, then lower wealth inequality allows for a broader pool of educated workers. By establishing a link between the extent of the structural transformation across France and Church land redistribution and the intensity of emigration, our studies shed new light on the economic legacy of the 1789 Revolution. More broadly, our analysis speaks to questions of concern to developing countries – both historically and today – regarding the relationship between institutional change, inequality, and long-run economic development. Acemoglu, D, D Cantoni, S Johnson, and J A Robinson (2011), “The consequences of radical reform: the French Revolution”, American Economic Review 101(7): 3286-3307. Bodinier, B and E Teyssier (2000), “L'événement le plus important de la révolution, la vente des biens nationaux”, Société des études robespierristes et Comité des travaux historiques et scientifiques, Paris, France. Cobban, A (1962), The social interpretation of the French Revolution, Cambridge University Press, Cambridge, UK. Finley, T, R Franck, and N D Johnson (2017), “The effects of land redistribution: evidence from the French Revolution”, Working paper, George Mason University. Furet, F (1978), Penser la révolution française, Gallimard, Paris, France. Franck, R, and S Michalopoulos (2017), “Emigration during the French Revolution: consequences in the short and longue durée”, NBER Working Paper 23936. Galor, O, and O Moav (2004), “From physical to human capital accumulation: inequality and the process of development”, Review of Economic Studies 71(4): 1001-1026. Galor, O, and J Zeira (1993), “Income Distribution and Macroeconomics”, Review of Economic Studies 60(1): 35-52. Greer, D (1951), The incidence of the emigration during the French Revolution, Gloucester, MA: P. Smith. Guizot, F (1829-1832), Histoire générale de la civilisation en Europe depuis la chute de l'empire romain jusqu'à la révolution française, Paris: Pichon et Didier. Hobsbawm, E J (1990), Echoes of the Marseillaise: two centuries look back on the French Revolution, London: Verso Books. Jaurès, J (1901-1903), Histoire socialiste de la Révolution française. Lecarpentier, G (1908), La vente des biens écclésiastiques pendant la révolution française, Paris: Alcan. Marx, K (1843 ), Critique of Hegel's Philosophy of Right, Cambridge University Press, Ed. Joseph O Malley. Mathiez, A (1922-1924), La Révolution française, Paris: Librairie Armand Colin. Rosenthal, J-L (1988), The fruits of revolution. Property rights, litigation and French agriculture, 1700-1860, Cambridge, UK: Cambridge University Press. Schama, S (1989), Citizens: a chronicle of the French Revolution, New York: Random House. Soboul, A (1962), Histoire de la Révolution française, Editions Sociales, Paris. Taine, H (1876-1893), Les origines de la France contemporaine, Paris: Bouquins . Thiers, A (1823-1827), Histoire de la révolution française, Paris: Lecointre et Durey. Weaving together the findings of both studies, some of us uncover that the extent to which the local elites were able to benefit from the confiscation of the Church property crucially depends on the extent of emigration during the Revolution (Franck and Michalopoulos 2017). Specifically, that study establishes that the negative impact of emigration on land concentration is magnified precisely in areas where more Church land was auctioned off. Senior Lecturer at the Department of Economics, Hebrew University of Jerusalem.